IME-Autolift is one of the world’s leading manufacturers of railway maintenance equipment and railway lifting jacks. This family business is a full-line provider for railway vehicle workshops, also equipped with bogie maintenance. The focus is on railcar lifting jacks for all kind of railway vehicles, trucks, trailers and buses, as well as on bogie lifters, bogie turntables, and bogie drop tables. Lifting and turning devices, together with a line of small mobile manipulators, complete the portfolio. IME-Autolift works globally with distributors in many countries and is your perfect partner for railway lifting equipment and jacks. A listed supplier with most major rolling stock OEMs and many major train companies, IME-Autolift can look at a reference list that contains hundreds of projects and thousands of delivered lifting jacks globally. The modern production plant and the sales department is of course certified according to ISO 9001:2008, as well as from some of the major OEMs and train companies, and can ensure a proper and standardised processing of project management. IME-Autolift provides a wide variety of lifts and jacks for railway vehicles of all types. Amongst these are an extensive range of mobile lifting jacks for rail vehicles from light-rail carriages to complete heavy-rail multiple units, as well as stationary train lifting systems and lifting-turning devices. All these different types of railway lifting jacks can be linked and operated in a multiple-jack arrangement. The railcar lifting jacks can be equipped with fixed or adjustable lifting claws and different wheel sets and are easy to handle, to offer total flexibility for the client. IME-Autolift’s mobile railway lifting equipment offers solutions for all your railway vehicle servicing needs. New wireless connections of the railway lifting jacks mean no more leads and cables. Battery powered lifting jacks mean complete flexibility on how and where they will be used. Double spindle jacks allow to separate the bogie from the wagon frame with one and same jack. 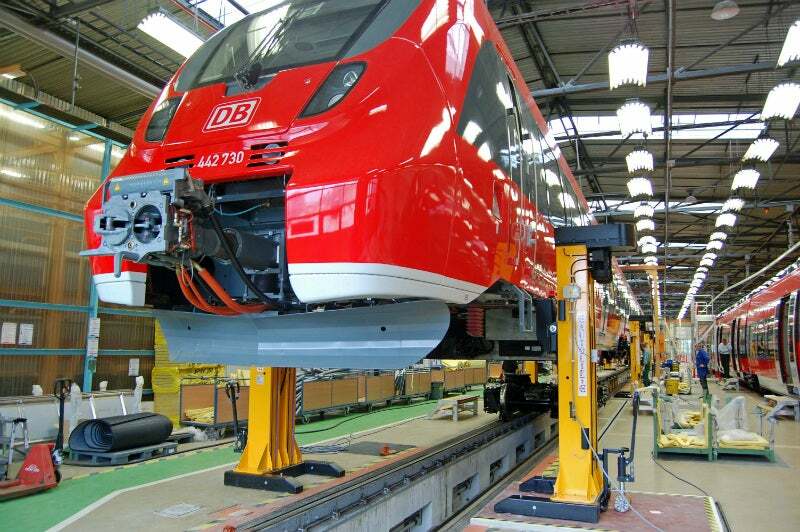 IME-Autolift stationary, under-floor lifting systems offer fast lifting of complete trains directly under the bogies. Equipped with supporting columns, bogies can be quickly and easily changed by using this lift. When the lift has descended, its workshop area remains clear of machinery and can be easily used for other equipment or by personnel carrying out other tasks. IME-Autolift offers as well customised under-floor lifting jacks and under-floor lifting stands. IME-Autolift offers a range of customised lifting-turning systems for wagon manufacturers and bogie workshops. Welding works on wagon-frames or bogie frames or for complete wagons is made especially easy by using IME-Autolift lifting and turning devices. For the Bogie maintenance workshop IME-Autolift offers a wide range of in-ground bogie lifts, mobile lifting jacks for bogies and 4-post lifts for bogies. IME-Autolift designed self propelled, battery powered bogie drop tables for dismantling bogies under the lifted train and to bring them to the bogie workshop, which is a logical and useful completion to the mobile lifting jacks. All IME-Autolift lifts are designed to specific requirements to precisely suit each client’s needs. IME-Autolift railway vehicle lifts are distinguished for high quality, efficiency and productivity, as well as affordable prices. IME-Autolift offers a wide range of mechanical and electrical turntables for wheel sets and complete bogies. IME-Autolift offers as well a wide range of self-propelled battery-powered manipulators equipped with changeable lifting tools for heavy railway parts like buffers, batteries, wheels, wheel sets, couplers, springs, brakes, dumpers and even doors and windows. IME-Autolift, one of the leading manufactures for railway lifting equipment, will be present at InnoTrans 2016 to display their latest solutions and portfolio of mobile lifting jacks, underfloor systems, bogie solutions along with turntables and lifting-turning devices. IME-Autolift presents its range of lifting equipment, which comprises mobile lifting jacks, underfloor lifting systems, electromechanical underfloor lifting stands and bogie lifters. IME-Autolift offers three different column designs. The 7.5t-10t column is for trams, metros and wagons, and with fixed support 4 - 16 columns can be combined. IME will be attending and participating at Innorail 2015 in Budapest, 14 - 16 October the second international conference on railway infrastructure and innovation in Europe. The development of this system originates in the wish of an Australian customer who was planning a fully automated maintenance depot with on-floor lifting jacks that have a bogie lift integrated. IME-Autolift is exhibiting at Trako 2015, in Gdansk on 22nd-25th September 2015.